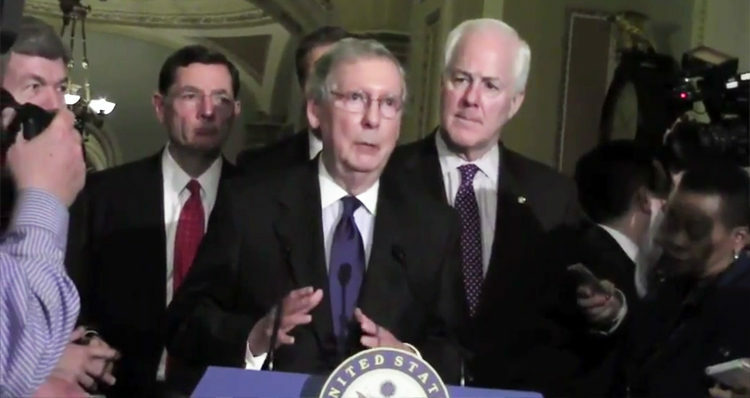 The stunning hypocrisy of Mitch McConnell is on full display this week, but do you remember the time he sounded like a stammering fool during a press conference? Senate Majority Leader Mitch McConnell (R-KY) is once again flaunting his hypocrisy on Capital Hill – this time whining about Democratic plans to block Trump’s Supreme Court nominee. This, of course, comes in the wake of Republicans’ refusal to hold hearings on President Obama’s nominee, Merrick Garland, whose nomination expired the day before as reported by Huffington Post. More recently and perhaps more entertaining, however, is a 2013 press conference when McConnell ended up sounding like a stammering fool, repeating himself three times in an effort to dodge a question regarding possible ethics violations by his office during his 2014 bid for reelection. As reported by Mother Jones at the time a secret recording from February 2013 had been revealed in which McConnell and his aides were captured discussing how they could attack Ashley Judd who was considered a serious contender for the Senate seat held by McConnell. The tape raised serious ethical considerations for McConnell and his staff as Senate rules strictly prohibit Senate employees from engaging in any political activities while on the clock or otherwise receiving government pay. You can watch the press conference, below, and let us know if you think that anyone is actually fooled by his line of B.S.